“On reaching Jerusalem, Jesus entered the temple area and began driving out those who were buying and selling there. He overturned the tables of the money changers and the benches of those selling doves, and would not allow anyone to carry merchandise through the temple courts. And as he taught them, he said, “Is it not written: `My house will be called a house of prayer for all nations’? But you have made it `a den of robbers. '” The chief priests and the teachers of the law heard this and began looking for a way to kill him, for they feared him, because the whole crowd was amazed at his teaching.” (Mark 11:15-18). Jesus’ cleansing of the Temple in Jerusalem is one of the most fascinating aspects of his life and personality. It is a story which grabs our attention, and makes us think that perhaps, on this one occasion, Jesus went a little too far. The story, in fact, has a much deeper dimension than whether Jesus got a little too angry. The story speaks to a more dramatic cleansing: the doom of the Temple and the whole Old Testament economy. So what’s going on with Jesus and the money-changers in the Temple? Is Jesus simply ticked off that there is commerce going on in the Temple? Or is there a far deeper concern on the mind of Jesus? Jesus’ cleansing of the Temple foretells its doom. “Jesus’ dramatic demonstration of overturning tables foreshadows the Temple’s violent destruction in A.D. 70.” Jesus wasn’t just overturning tables in the Temple; he was overturning the whole Old Testament economy. New wine cannot be placed into old wine skins. Jesus himself will be the new, indestructible Temple. In Chapter 13 of Mark’s Gospel Jesus will foretell with remarkable accuracy the destruction of the Jerusalem Temple which occurred less than four decades after His death and resurrection (see Reference below). Reference: I am relying entirely on the notes in the Ignatius Catholic Study Bible for The Gospel of Mark. 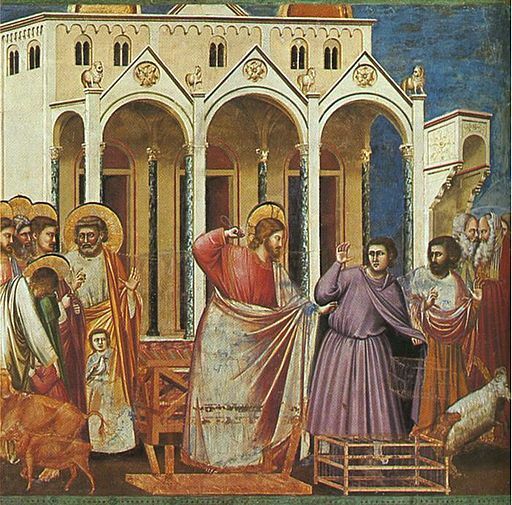 Image: Giotto (1266-1367) “Expulsion of the Money-Changers from the Temple,” (Public Domain, U.S.A.).